I recently received an email that showed a photo of an exotic mother bird perched, alert and regal, on a tree limb. Beneath each of her outstretched wings were her two offspring, looking peaceful and content as they nestled against her colorful body. Though a very beautiful bird, I could sense that the mother fully understood her role as protector. She would do anything to keep her young safe. To these little birds, their momma’s wings were a place of refuge. 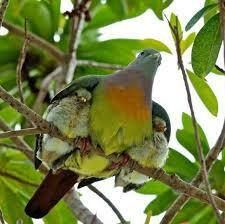 A mother bird’s caring wings do so much more than provide shelter from the rain. Her protective instincts inspire her to meticulously build a nest home among the tree branches far above predators. That intuition urges her to feed, nurse, and comfort her young every day until they are able to live on their own. Without her, the tiny baby birds would not survive. A human mother is no different. Each one of her motherly acts is a testimony of her love for her children. Why else but for love would someone stay up most of the night nursing someone back to health? What else would inspire her to give up a day shopping for herself to see her children fed? Or to spend hours washing clothes she didn’t soil, cleaning a house she didn’t dirty, and fixing problems she didn’t create? Though we would say these attributes are instinct, this heart of love was placed there by Father God, the Author of love (I John 4:8). In fact, He is the greatest example of loving sacrifice that has ever been (John 3:16, John 15:13). We think that our mothers have given up much, yet nothing could compare to God’s selfless gift. Our sin made a mess that God didn’t create. He cleaned it up anyway with His Son’s own blood, and gave us eternal security in His home. Like those two little birds, snuggled up beneath those strong, outstretched wings, our Heavenly Father is all that we need.